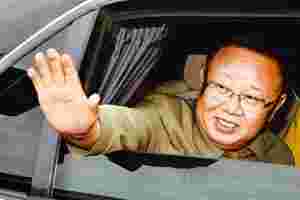 Washington: Kim Jong Il, the reclusive dictator who kept North Korea at the edge of starvation and collapse, banished to gulags citizens deemed disloyal and turned the country into a nuclear weapons state, died Saturday morning, according to an announcement by the North's official news media on Monday. He was reported to be 69, and had been in ill health since a reported stroke in 2008. North Koreans heard about him only as their "peerless leader" and "the great successor to the revolutionary cause." Yet he fostered what was perhaps the last personality cult in the Communist world. His portrait hangs beside that of his father, Kim Il Sung, in every North Korean household and buildings, towers, banners and even rock faces across the country bear slogans praising him. Kim was a source of fascination inside the Central Intelligence Agency, which interviewed his mistresses, tried to track his whereabouts and psychoanalysed his motives. And he was an object of parody in American culture. Short and round, he wore elevator shoes, oversize sunglasses and a bouffant hairdo—a Hollywood stereotype of the wacky post-Cold War dictator. Kim himself was fascinated by films. He orchestrated the kidnapping of an actress and a director, both of them South Koreans, in an effort to build a domestic movie industry. He was said to keep a personal library of 20,000 foreign films, including the complete James Bond series, his favourite. But he rarely saw the outside world, save from the windows of his luxury train, which occasionally took him to China. He was derided and denounced. President George W. Bush called him a "pygmy" and included his country in the "axis of evil." Children's books in South Korea depicted him as a red devil with horns and fangs. Yet those who met him were surprised by his serious demeanour and his knowledge of events beyond the hermit kingdom he controlled. "He was a very outspoken person," said Roh Moo-hyun, who as South Korea's president met Kim in Pyongyang in 2007. "He was the most flexible man in North Korea." Wendy Sherman, now the No. 3 official in the state department, who served as counsellor to secretary of state Madeleine K. Albright and accompanied her to North Korea, said in 2008, "He was smart, engaged, knowledgeable, self-confident, sort of the master-director of all he surveyed." Albright met Kim in October 2000 in what turned out to be a futile effort to strike a deal with North Korea over limiting its missile programme before president Bill Clinton left office. "There was no denying the dictatorial state that he ruled," Sherman said. "There was no denying the freedoms that didn't exist. But at the time, there were a lot of questions in the US about whether he was really in control, and we left with no doubt that he was." When Albright and Sherman sat down to talk through a 14-point list of concerns about North Korea's missile programme, "he didn't know the answers to every question, but he knew a lot more than most leaders would—and he was a conceptual thinker," Sherman added. And though he presided over a country that was starving and broke, he played his one card, his nuclear weapons programme, brilliantly, first defying the Bush administration's efforts to push his country over the brink, then exploiting America's distraction with the war in Iraq to harvest enough nuclear fuel from his main nuclear reactor at Yongbyon to produce the fuel for six to eight weapons. Bush said during his first term in office that he would never tolerate a nuclear North Korea, but as his presidency wound down, many of his aides believed he did exactly that. Kim is believed to have been born in Siberia in 1941, when his father was in exile in the Soviet Union. But in North Korea's official accounts, he was born in 1942, in a cabin, Abraham Lincoln-like. The cabin was in a secret camp of anti-Japanese guerrillas his father commanded on Mount Paektu, a holy piece of land in Korean mythology. The event, the official Korean Central News Agency would often say, was accompanied by the appearance of a bright star in the sky and a double-rainbow that touched the earth. Little is known of his upbringing, apart from the official statement that he graduated in 1964 from Kim Il Sung University, one of the many institutions, buildings and monuments built to commemorate his father. At the time, North Korea was enmeshed in the Cold War, and the younger Kim watched many crises unfold from close-up, including North Korea's seizure of the USS Pueblo, a US spy ship, in 1968. He appeared episodically at state events, rarely speaking. When he did, he revealed that he had a high-pitched voice and little of his father's easygoing charisma. The world did not hear his voice until 1992 when he issued a one-liner while overlooking an enormous Armed Forces Day parade: "Glory to the heroic People's Army!" It was not until 1993, as the existence of the Yongbyon nuclear plant and North Korea's nuclear weapons ambitions became publicly known, that Kim appeared to be his father's undisputed successor. That year, he became head of the National Defence Commission, the North's most powerful agency, in charge of the military. In 1994, in a showdown with the US, North Korea threatened to turn its stockpile of nuclear fuel into bombs. It was the closest the two countries came to war since the armistice ending the Korean War was signed in 1953. The stand-off was defused when Kim Il Sung welcomed former president Jimmy Carter, who pushed Clinton and Kim into a deal. Within a month, however, Kim Il Sung, the country's founder and Great Leader, was dead. Many doubted at the time that the younger Kim would take over. There were rumours of a military coup, and theories that he would be allowed to keep his fast cars and to consort with visiting European "entertainers" as long as he did not try to run the country. Like much intelligence about North Korea, that turned out to be wrong. Kim has three sons, any of whom could potentially have succeeded him. But his home life is a mystery. His oldest son, Kim Jong Nam, would have been the natural choice to succeed him. But he had a handicap: his mother never married Kim Jong Il. Since his health crisis, in 2008, Kim had been grooming his third son, Kim Jong-un, believed to be in his late 20s, to be his successor. Choe Sang-Hun contributed to this story.